Were those risks to crystallise, we judge that the first risk is likely to have only limited impact on financial stability. This is because the price of collateral should adjust after some time bringing the market back to equilibrium. The second risk, however, could severely impair market functioning, as it might take a long time to generate additional intermediation capacity (e.g. via dealers’ issuance of new equity or establishing new intermediaries). More detail on this work is presented in the accompanying Staff Working Paper No. 609. Throughout, we focus only on high-quality collateral (which we define as AAA/AA-rated government bonds, agency MBS and supranational bonds), as we expect these assets will be relied upon during periods of stress. Risk 1: Is there enough high-quality collateral to support the functioning of the financial system during periods of stress? The increasing reliance on collateral – driven by both market forces and regulatory change – has prompted concerns about its potential shortage. The outstanding amount of high-quality securities is vast (around US$42 trillion at end-2014), which – taken at face value – might suggest that the likelihood of collateral shortage is quite small. However, only a small proportion of this is currently available to support market functioning. This is because a large proportion of this aggregate supply is ‘siloed’: that is, unavailable for re-use as collateral, because it is held in institutions’ liquid asset buffers, as initial margin against derivative exposures, or by end-investors who are unable (e.g. money market funds (MMFs) or unwilling (e.g. insurance companies) to lend them out. Thus, we estimate there is only around US$3 trillion of high-quality collateral that is made available for use in facilitating market transactions. Currently, not all of this made available supply of collateral is utilised (i.e. actually lent out). We estimate that the total end-user demand for high-quality collateral is around $1.6 trillion, or roughly half of the effective collateral supply. This figure reflects demand for collateral arising from a need for secured investment of cash by MMFs, corporates, and cash collateral re-investment programmes. But – in and of itself – this is insufficient for us to conclude that there is no shortage of high-quality collateral. This is because supply of, and demand for, high-quality collateral tend to vary with the level of market stress. In particular, the supply of collateral made available via securities lending has varied historically – and particularly during the crisis – with lenders’ varying perceptions of counterparty credit risk. Based on a series of empirical historical relationships, the green line in Chart 1 shows the made available supply of collateral as a decreasing function of market stress (which we proxy with the quarterly average of the level of the VIX index of equity volatility). Sources: Bloomberg, BIS, Dealogic, Data Explorers, ECB, FSB, ICMA, ISLA, SIFMA, SNL and Bank calculations. Total demand for collateral, on the other hand, tends to increase with the level of market stress. In particular, demand for collateral for use as initial margin is assumed to increase with volatility (Chart 1, pink and light-blue areas) from its steady-state level, accounted for as ‘siloed’ collateral (see above). This is consistent with the dynamics of the models used by major central counterparties to calibrate their required level of initial margin. Increases in banks’ liquid asset buffers (held in the form of high-quality securities) from its steady-state level is also modelled as a linear increasing function of market stress (Chart 1, dark-blue area), which could be explained by ‘precautionary’ liquidity hoarding by banks. Combining the profiles for collateral demand and supply brings us to Risk 1: that is, the possibility that as market stress intensifies, total demand for high-quality collateral eventually exceeds its made available supply. This is estimated to occur when the quarterly average of the VIX index reaches a level of around 44 per cent (Chart 1). To put this into perspective, historically there has only been one occasion (in late 2008) when the quarterly average value of the VIX index was at a level sufficient to trigger Risk 1. This suggests that Risk 1, although feasible, is of relatively low probability. We also judge that, were this risk to crystallise, it would have only moderate impact on financial stability, since – at least after some time – the price of accessing high-quality collateral should adjust to restore the equilibrium between supply and demand. Risk 2: Can collateral get to where it is most needed? Leveraged intermediaries, in particular broker-dealers, play a key role in mobilising collateral: that is, moving it between those that supply and demand it. This happens primarily via a series of repo/reverse repo and securities lending transactions. The central role of dealers in collateral mobilisation arises from how most end-users of collateral are not directly connected to its end-suppliers (or indeed, not all dealers are directly connected with each other). This can be seen clearly from the structure of the repo market, which is depicted in Chart 2 (dealers are shown by red dots and their clients by blue dots). (a) Covers UK-regulated dealers and their clients only. Red dots represent dealers and blue dots represent customers. Red lines represent interdealer repo transactions; blue lines those between dealers and their clients. 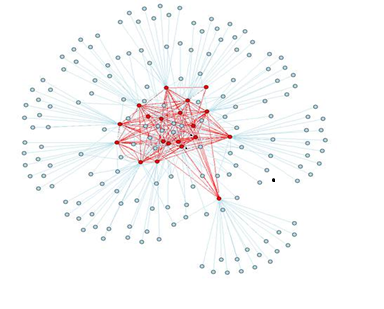 More connected counterparties are clustered in the centre of the network. Data are as at end-2014. This implies that every unit of collateral has to pass through a chain of intermediaries’ balance sheets. We estimate the average length of such ‘collateral supply chains’ to be around 3.9. Essentially, this means that for every dollar of collateral demand, $3.9 dollars of repo/reverse repo transactions are required to move this collateral from end-supplier to end-demander (what we call required repo intermediation capacity (RIC)). 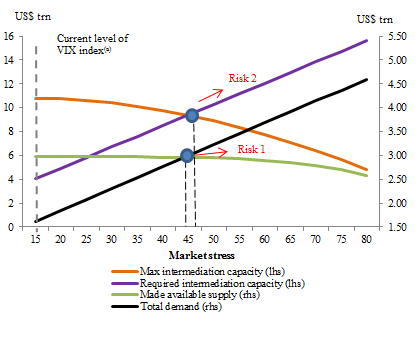 Thus, as demand for collateral increases during times of stress (Chart 3, black line), dealer intermediation capacity required to move this collateral increases as well (Chart 3, purple line). While ‘required intermediation capacity’ increases with market stress, the maximum repo intermediation capacity that dealers are willing/able to provide is likely to decrease. In our work, we identify and model two potential drivers for such behaviour. 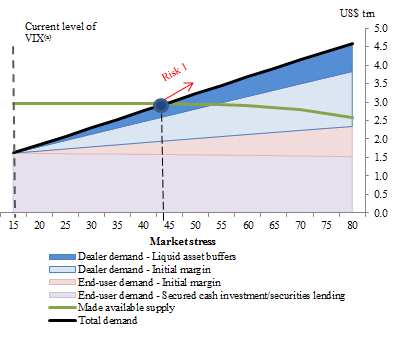 First, during the periods of severe market stress, dealers are likely to experience losses on their balance sheets (e.g. mark-to-market losses on derivatives and trading securities), which reduces dealers’ equity and mechanically limits their ability to lever up. Second, as market stress intensifies, dealers may become more risk-averse and may find it optimal to have a lower leverage for any given amount of equity and voluntarily reduce the size of their books. Combining these two effects allows us to plot dealer maximum intermediation capacity as a declining function of market stress (Chart 3, orange line). The point at which dealer intermediation capacity required to move collateral between end-users starts to exceed the maximum capacity that dealers are able/willing to provide is that at which Risk 2 crystallises. This is the risk that in future periods of stress – although the demand for collateral might not exceed end investors’ ability to supply it (e.g. because price adjustment has restored the equilibrium) – collateral may become ‘blocked’: that is, unable to reach those that wish to use it, due to a shortage of intermediation capacity. We estimate that this risk crystallises when the VIX index exceeds 46 per cent over a period of a quarter (Chart 3). Although Risk 2 is slightly less likely to crystallise than Risk 1, it is likely to persist (as it can take a long time for new intermediation capacity to come to the market) and, thus, could have a significant negative impact on financial stability. In particular, if triggered, Risk 2 will likely prevent collateral from performing its role of supporting market functioning. The consequences of this might include a sudden inability of market participants to obtain collateral to post initial margin on their derivative portfolios, leading to a potentially disorderly unwind of positions and/or inability of leveraged investors (e.g. hedge funds) to fund their positions and continue supporting market liquidity. If Risk 2 crystallised, banks could also experience significant difficulty monetising their liquid asset buffers via repo markets. Yuliya Baranova, Zijun Liu, Joseph Noss work in the Bank’s Capital Markets Division. Previous Post Robot Macroeconomics: What can theory and several centuries of economic history teach us? Excellent analysis on the “plumbing” at the heart of modern capital markets. This is similar to market liquidity at crises – it is not there when one needs it the most, and “liquidity providers” previously available were nowhere to be seen.